Natures available: Calm, Bold, Modest and Timid! Not nature locked, so i soft resetted for the natures. Hp Fire. Set the Receiving gift as usual so the cartidge wouldn't function. The receiving date set to receive hte gift is Spring 2011. Becausein May we say: "En Mai, fais ce qu'il te plait! ", it's what Celebi does doesn't he? Do want you want. Although from an official cart, this Celebi was never meant to be released, similar to the Azure Flute. For that reason I'll have to request you not trade it. Gaudi we can trade now if you are free. I am ready to trade as of this post Gaudi. At the time of your previous post I was at work. Also I thought as much you could not find a way to nickname a traded pokemon. Otherwise it would be too easy for me to give my pokemons' names. I am interested in an Arceus nicknamed Arbiter, preferably from Sinnoh using the Azure Flute event item. Also I am interested in a level 1 Shiny Bagon named Shinryu with the egg moves dragon dance, hydro pump, and thrash. I actually have 2 parent bagons ready. One with the near perfect ivs and the other with the egg moves and sheer force. I prefer intimidate as the ability. I am still not sure on nature. Either Hasty or Jolly is fine I think. The nickname Shinryu is from Final Fantasy 5 superboss Shinryu. Thank you very much. I apologize for repeating an earlier post. Again like all the requests I have made, I do not want to pressure you into doing this immediately. Please take your time. Hatched at Ten Carat Hill because it's the only way to found this guy! Caught this myth the 2 january 2019 at 23: 21:11! Proof on my ds i don't haveon hand. Caught my funny Lombre in Ultra Space Wild that's why it is in a fierce Beast Ball! Hatched at Brooklet Hill since I was early in the game and it fits well to this lazy mons! 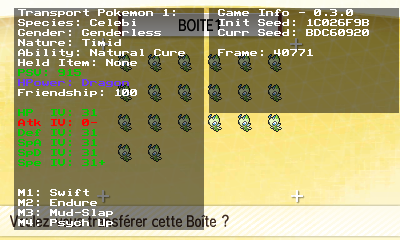 RNG Project For Zekrom117 . Hatched at Brooklet Hill since I was early in the game and it fits well to this harshish mons! Caught in a friend ball, vulontary mismatch for his color. He's bulliyed due to his lack of beauty but he wants to be evreryobdy's friend! Hi Gaudi , I am interested in #671- La Duchesse ♀★) and #052 - Happy Meowth (♀) ! Can I offer you hasty surf celebrate pikachu and shiny jolly emboar ? I will be on tomorow morning! ok got it , will message you again after I cloned it ! Hi Gaudi , I am interested in #386- Deoxys - ★) , #386 - Deoxys-A Ø ★ and #386 - Deoxys-D Ø ★ ! Can I offer Shiny Timid Nihilego with hp Ice , Shiny Adamant Regigias and Celebrate Meloetta for the above ? Of course! Maybe we can set up the trade today? I let u know again soon ! Bar meleotta, I still need to clone shiny nihilego and regigigas ! Caught Tornadus yestarday after Regi and Thundurus (see above). It was caught the 23 january 2019. A proud RNG, Hidden power Ice, and a low attack. I do not forget the amazing mons received from Bluemew. ChrisDoukas C y 1 Eppie MightyNico !!! Hi Gaudi , I am interested in the below Aldora Articuno and Aldora Zapdos (Kalos). I am offering Relaxed Shiny Cresselia , Shiny Timid Deoxys Speed for the 2 mons ! Do you have Aldora Moltres (Kalos) as well? Caught on retail the 26 january 2019. In a fast ball to match Raikou Profil, plus it was the easiest pick. Snagged to Lovrina, same as Delcatty. Caught on retail the 25 january 2019. In a love ball to match Virizion Profil, but it wasn't an easy one since my Spore Smeargle attack was uneffective! That's a hard decision i make, I know. But to much bad luck, misery, and fear about the real world. It's time to move on, i have a carriere to achieve. Sorry guys, friends and trusted person i had love to meet here. But i'm not over! I'm continuing for the smeargle studio, maybe showdown., we'll see! I'm getting back with Maxime, my boyfriend, so cute. "Y a R" as he says, means "ther's nothing" in french. Mr.GX ;) great deals with you! Inkblot o/ you own all my respect! ChrisDoukas o/ what the... badass trader! [user]C y 1 [user/] :p you are a good person! @Thechaotician ^^ BEST RNGer i knew here. Bluemew. respect, all your GA, your contributions ! Blueforce respect all your GA, your contribution! And many many others I don't have in my mind. you, poeple drew me a wonderful sketch of possible angle of possiblity, I mean, i know what I don't want, and what I want. Tired of being scammed (no offense), tired of scheduling trade anytime (for the sensible person I am), tired of... The Franchise. For now! Wherever there's a door that closes, there's another one that opens. I wish you nothing but a lot of open doors in real life. It looks like you've got your priorities right. Take care of your health and your real life obligations. You're more than welcome to swing by on our Discord server every now and then to say 'Hi'. I'd love to stay in touch with you. Goodbye Gaudi. Thank you for all the time and patience you had with me when we were setting up trades together. I am going to treasure the Pokémon you took the time to create even more now. I wish you good luck in your career and future life obligations. I am sad that you will be gone from the Pokémon smog on scene but again I thank you for all you have done for me and everyone here. I do hope to battle you someday.